In starting this blog I wrestled a bit with the problem of scope--what should I write about? A blog is part of the social media landscape and that's been changing rapidly--not just the channels, but also the content. Today I attended the Northwest Entrepreneur Network (NWEN) workshop on social media, given by Andy Boyer and Xavier Jimenez, co-founders of social3i.com. Lots of great material, useful references and actionable ideas. I asked about the increasingly blurring or even disappearing line between business and personal content: many of us have a LinkedIn profile that describes our professional experience, relationships and expertise. Many of us also have Facebook pages or Twitter feeds that we share with our friends. Until recently I largely kept these separate, with my business contacts in LinkedIn and my friends and family on Facebook. But over time this doesn't really work. My friends are often part of my business network. Business colleagues find me on Facebook and want to connect. 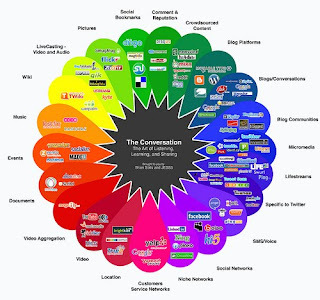 Different social media platforms are much more effective when linked together. Twitter feeds into Facebook. Plaxo and LinkedIn status updates are synchronized. Links to new Youtube videos and blog posts are broadcast on Twitter. And webpages have links to all of them. Be a SME (subject matter expert)--yes--but more and other kinds of content is necessary too. If someone is going to not hire me because of social comments, that's OK. You can't hide. The more authentic and transparent you are, the more confidence people have when seeking you out. Andy added that much web content is now consumed through filters--Google Alerts, aggregators, Twitter searches, NetVibes, and the like. People mostly see what they're looking for, which might be only snippets of all the content one generates. So, the upshot? I'll write about what interests me without worrying much about whether this blog follows some carefully circumscribed theme. So I expect to post on energy technology and policy, climate change, the future, the dismaying and ongoing attacks on science, the shocking decline in critical thinking by our media, self-appointed pundits, and so-called leaders, occasional humor, and thoughts arising from experiences I've had as a manager, as an entrepreneur and as a business consultant. Pick what you like. Ignore what you don't. Better still, make a comment, post a link, start a conversation.